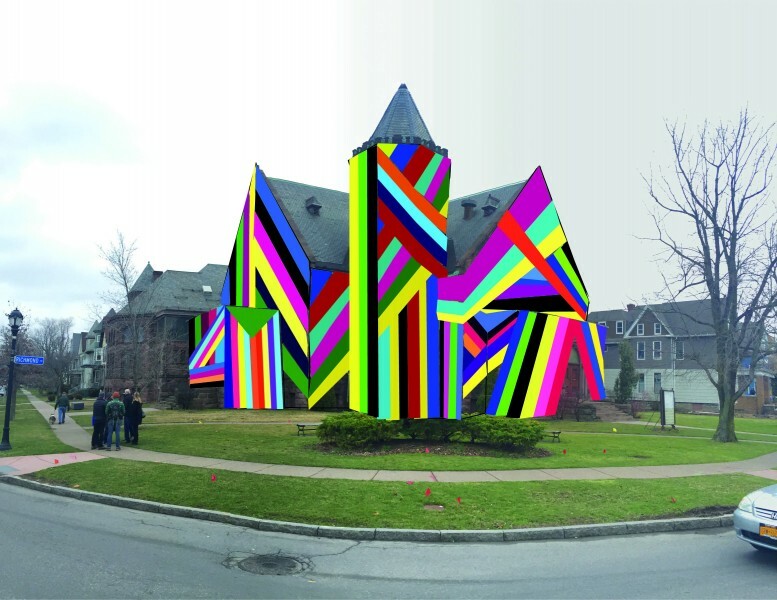 Amanda Browder’s “Spectral Locus,” a public art project involving huge sheets of colored fabric, will temporarily transform the former church at Richmond Avenue and West Ferry later this summer. For the past several weeks, Buffalonians have been working with New York City-based artist Amanda Browder to sew together what will become one of the more eye-popping public art projects in recent memory. Browder's project, "Spectral Locus," will cover in multi-colored fabric large sections of the former Richmond Methodist Episcopal Church at Richmond Avenue and West Ferry Street; the Eckhardt Building at 950 Broadway; and the Albright-Knox Art Gallery's Clifton Hall. Amanda Browder's "Spectral Locus," a public art project involving huge sheets of colored fabric, will temporarily transform the former church at Richmond Avenue and West Ferry later this summer. Stay tuned for more on the project as it moves toward its final stages in July.